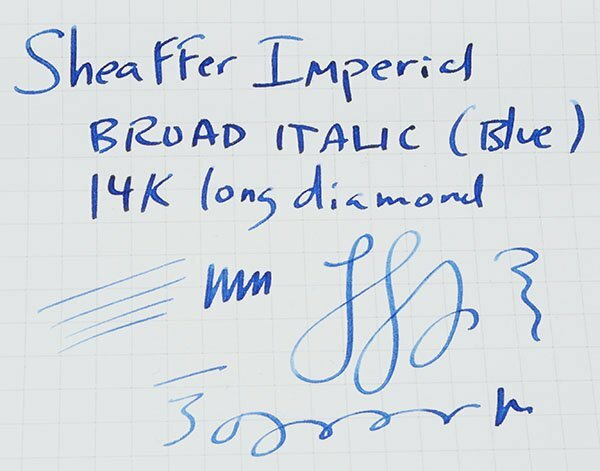 This Sheaffer Imperial nib has been custom ground to a broad cursive italic tip. It is compatible with any pen that accepts a standard Imperial screw-in nib unit. The nib is 14k. Filling System The nib is intended for pens which accepted Sheaffer converters and cartridges. It will not work in a touchdown filling system. Please write us if you have a question about its compatibility with your pen. Nib Cursive Italic broad. The nib work was done here at PSP by Nivardo Sanchez. See writing sample below. This is a long diamond 14k nib unit that would have originally been on a high end Imperial pen such as an Imperial VIII or Imperial IV. Condition Excellent condition with a few light marks picked up in storage. No cracks.